I usually don’t wear all black everything outfit-wise but sometimes like doing so. Black is a very chic and incredibly versatile color. It’s not gothic or “gloomy” dressing when done right. The key is to incorporate some color into an all black ensemble. Adding a pop of color, and it doesn’t have to be a bright color, will keep an all black outfit from being drab. In this case I chose silver details on my jacket, booties, bag and jewelry and then added a hot pink pout and blush to give my face some color. 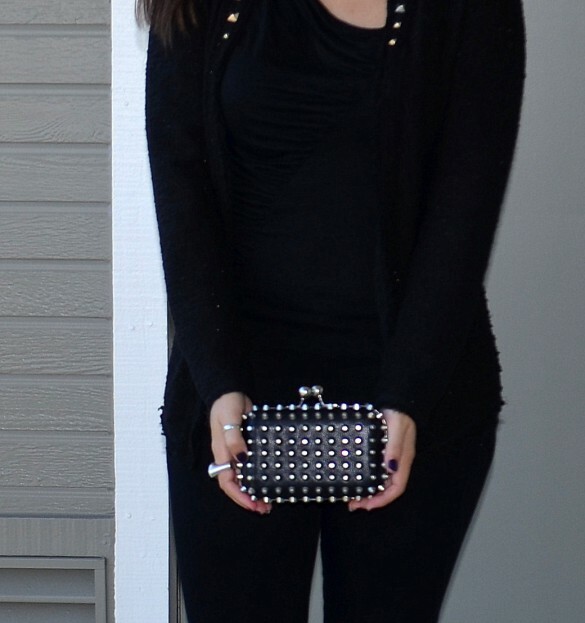 This entry was posted in All Black, Blazer, Chanel, dress chic for me, dresschicforme, fashion blogger, fuschia, Leather, Metallic, Neutral, Neutrals, Outerwear, Pop Of Color, Sparkly, Studs and tagged all black everything, all black outfit, all black outfit done right, all black outift, brunette, calvin klein, cat eye sunglasses, Chanel, chanel sunglasses, citizens, diamond necklace, Dress chic for me, dresschicforme, fall fashion, fashion blogger, girl about town, hot pink lips, long hair, long hair don't care, Mac, my style, nars, Nine West, nordstrom, not drab, ootd, pink pout, pop of color, silver details, studded bag, studded clutch, studded jacket, studs, Tiffany & Co, vintage booties, Zara. Bookmark the permalink.